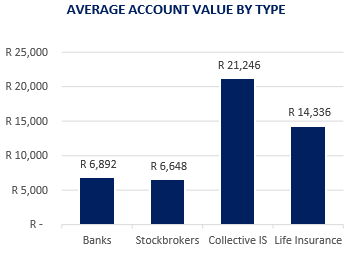 With R2,6bn invested across 262,493 accounts opened in the first year, tax-free savings accounts (TFSAs) are proving popular. Results of the much-anticipated savetaxfree.co.za tax-free survey are in and they paint a promising picture for the future of TFSAs. An estimated 21% of the accounts opened are believed to be opened by first-time savers. This suggests that government’s initiative to encourage a greater savings culture in SA may be on track. In a first survey undertaken last year – aimed at measuring the performance of TFSAs in the first four months since inception on 1 March 2015 – results revealed that a notable 35,384 accounts (excluding cash deposits) had already been opened, averaging 8,846 accounts opened a month. A third of the accounts opened at the time were believed to belong to first-time savers, and the bulk of the accounts opened were with life insurance companies. A year down the line, the TFSA landscape has evolved immensely. With banks showing a greater willingness to participate, the results of our second annual tax-free survey report are thus more comprehensive, painting a more accurate picture of the general performance of the industry in its first year. Click here for full report. Similar to our first survey, the results were drawn from responses to a questionnaire sent to TFSA providers. We estimate that more than 95% of the universe of TFSA providers responded. The main difference between our two surveys is that, this time around we were able to convince the banks to participate. 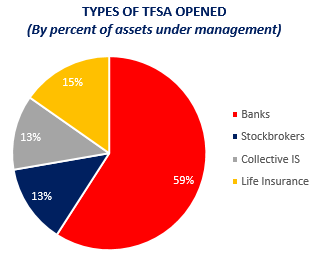 Including their figures provides a holistic picture of the TFSA market. Apart from assessing the state of the TFSA market in quantitative terms, qualitative issues were also explored, with the aim of providing insights both to policy makers and account providers. The survey focused on getting an indication of the take-up of tax-free savings during the first year of the product’s introduction to the South African market. With just over a year since they were launched, TFSAs have been well received by the South African market. The lifetime limit of R500,000 is however, proving to be an issue of growing concern among service providers. A seemingly unintended consequence is that investors are fearful of investing in a TFSA if they might need to draw cash in the short term. Once they draw out of the account, it permanently depletes the lifetime amount allowed.